asmadh acharya paryantam vandhe guru paramparaam"
A CERTAIN JEEVATHMA IS SELECTED BY LORD KRISHNA TO SHOW THE PATH TO OTHER JEEVATHMAS .THE SELECTED JEEVATHMA AFTER REALISING GOD STARTS TO PREACH ABOUT THE PATH TO REALISE GOD TO OTHER WORLDLY BEINGS(JEEVATHMAS). IN THIS CASE THE REALISED JEEVATHMA i.e. THE PREACHER BECOMES THE ACHARYAN OR GURU TO THE PREACHED ONES i.e. SISHYAS OR DISCIPLES.THIS ACHARYAN THEN CHOOSES AN APPROPRIATE SISHYA TO CONVEY HIS TEACHINGS TO THE UNREALISED WORLDLY BEINGS. THUS THIS SISHYA BECOMES AN ACHARYAN.THIS CYCLE CONTINUES AS A GURU PARAMPARA.IN INDIA THERE WERE MANY GREAT GURU PARAMPARAS SUCH AS THOSE OF RAMANUJACHARAYA, SHANKARACHARYA, MADHVACHARYA, VALLABHACHARYA, CHAITANYA MAHAPRABHU AND MANY MORE. GURU PARAMPARA IS THE SEED WHCH IS RESPONSIBLE FOR THE GROWTH OF A TREE CALLED BHAKTHI WHICH HAS SPREAD ITS BRANCHES ALLOVER THE WORLD. 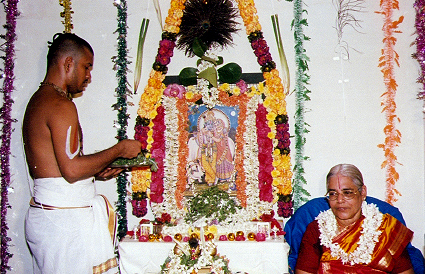 THIS GURU PARAMPARA IS STILL IN EXISTENCE WHICH HAS BEEN REVIVED BY POOJYA SHREE SHREE AMMA AND HER DISCIPLE MAHAN BRAHMA SHRI GOPALAVALLIDASAN.